These new Royal Mail stamps will be affixed to specially designed envelopes and then postmarked on the first day of issue. 24th May 2019 - Queen Victoria - Now available for pre-order. Limited Edition: 75 copies Worldwide. 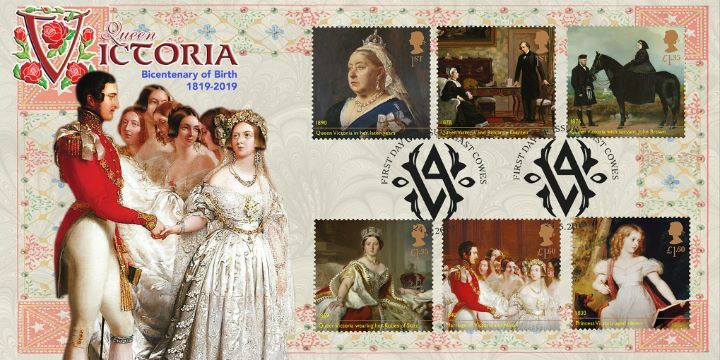 The above Royal Mail Queen Victoria stamps will be issued on 24 May 2019 by Royal Mail and feature the following stamp designs: 1st Queen Victoria in 1890; 1st Queen Victoria and Disraeli; £1.35 Queen Victoria on horseback; £1.35 Queen Victoria wearing the Robes of State; £1.60 Queen Victoria and Prince Albert marriage; £1.60 Queen Victoria as a young girl 1830. The Wedding to Prince Albert first day cover with the East Cowes, V & A, Special Handstamp postmark has been produced by Bradbury and features these stamps which can make a very collectible and lovely gift.